CityHouse's first apartment with a pool! Combining Vietnamese style with Western comfort, the glittering new Truong Quoc Dung street apartment building is incorporating all the lessons we've learned so far, into a single spectacular expression of modern luxury and convenience. Situated in Phu Nhan district, with the city center on one side and the airport on the other, Truong Quoc Dung is set right in the middle of the one of the most important business intercourses in Vietnam. Companies ranging from banks to English schools, tech corporations to retail outlets are dotted throughout the area, offering a vast opportunities for finding work and developing business relationships. 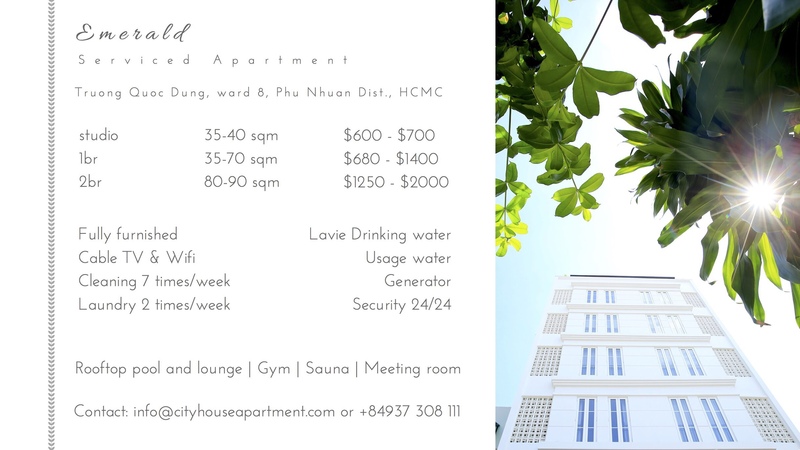 Outfitted with a swimming pool, gym, sauna, and with full complimentary CityHouse services, such as daily laundry and cleaning, Truong Quoc Dung is an entirely convenient escape from work at the end of the day. With everything taken care of, you can kick back, relax and enjoy yourself in your off hours. Or branch out from your apartment and tap into the vibrancy of Saigon’s leisure landscape, from kids days out to the local zoo, to the nightlife around Ben Thanh and Bui Vien, or the more civilised bars and cafes of the city center, Truong Quoc Dung is perfectly located to suit nearly all tastes. We're so happy and excited to finally have the privilege of unveiling it to our customers!. Phu Nhuan Theater: Where the most popular and newest Vietnamese dramas are played.